DogFence wants you to feel confident that your DogWatch system is protected should your home experience an electrical surge due to lightning. That’s why we’ve gone to extremes to equip your DogWatch Hidden Fence with both internal and external surge protection. 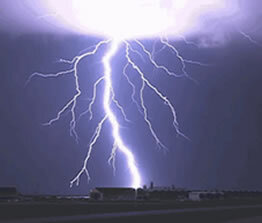 Every year UK properties receive lightning strikes – it has to go somewhere. Your boundary cable can act as a magnet and lightning strikes to flat ground can pick up your boundary cable and enter your home. Dogwatch’s unique lightning protection safeguards your system. No other hidden fence system contains this prevention and warrants your system against lightening strikes. With DogWatch you have ultimate protection from electrical surges that travel (1) into your house through other sources or (2) through the underground boundary wire in your garden. This unique two way protection was developed and thoroughly tested by experts in the field of lightning expressly for DogWatch products. We’re so confident that our lightning and surge protection is unsurpassed, that we provide a lifetime warranty with your transmitter. (Applies to System 1200 and Performance Series Systems only). DogFence cannot change Mother Nature or eliminate surges from hitting close to home, but we can help minimize the potential damage caused by surges to your DogWatch Hidden Fence System. System meets USA (FCC), Europe (CE), Japan (VCCI) and Australian standards for EMC emissions and immunity. Power supply and surge protector are UL & CE approved. Systems use a two-step lightning protection design recommended by telecommunications industry and lightning protection companies. DogFence’s invisible pet fence is an excellent and affordable solution for your dog containment. DogFence have pioneered full service electronic pet containment solutions in the UK. Traditional dog fencing and cat fencing are not always the solution. Dogs can dig, jump or escape by pushing through the boundary! Containing cats can be even more difficult, as cats can easily jump or climb over fencing.